I hope this unique save-the-date will inspire my Jewish readers to take their cards to the next level. 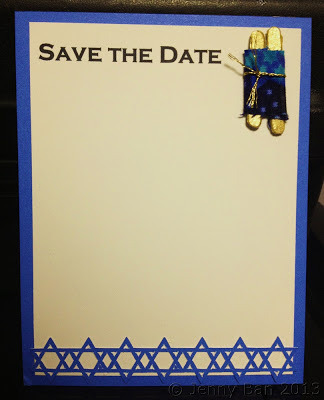 The customer request I received was for a "save the date" to send to her guests for her grandson's bar mitzvah. She wanted a card she could hand write that said "save the date" and had a Torah. I tried to take it to the next level with my design. Here is a little tutorial. I hope you enjoy! Break 1/2" off top (rounded end) of 4 craft picks. Cover rounded ends in gold washi tape and trim around edges. Wrap ends of fabric around washi-covered craft picks as shown. Iron to adhere interfacing to craft picks/itself. With rolled-in ends on bottom, tie gold embroidery thread around "Torah" and knot twice. Apply large glue dot to back of "Torah" and adhere to card.